"Titan is just covered in carbon-bearing material — it's a giant factory of organic chemicals," according to Ralph Lorenz of Johns Hopkins University Applied Physics Laboratory. "We are carbon-based life, and understanding how far along the chain of complexity towards life that chemistry can go in an environment like Titan will be important in understanding the origins of life throughout the universe." This BBC docmentary below describes a voyage of exploration like no other – to Titan, Saturn's largest moon and thought to resemble our own early Earth. For a small team of British scientists this would be the culmination of a lifetime's endeavor – the flight alone, some 2 billion miles, would take a full seven years. This is the story of the space probe they built, the sacrifices they made and their hopes for the landing. Would their ambitions survive the descent into the unknown on Titan's surface? "When we designed the original tour for the Cassini spacecraft, we really did not know what we would find, especially at Enceladus and Titan," said Dennis Matson, the JPL Cassini project scientist. Unlike Earth, Titan's lakes, rivers and rain are composed of methane and ethane, and temperatures reach a chilly minus 180 degrees Celsius (minus 290 degrees Fahrenheit). Although Titan's dense atmosphere limits viewing the surface, Cassini's high-resolution radar coverage and imaging by the infrared spectrometer have given scientists a better look. Titan has hundreds of times more liquid hydrocarbons than all the known oil and natural gas reserves on Earth, according to new data from NASA's Cassini spacecraft. The hydrocarbons rain from the sky, collecting in vast deposits that form lakes and dunes. At an eye popping minus 179 degrees Celsius (minus 290 degrees Fahrenheit), Titan has a surface of liquid hydrocarbons in the form of methane and ethane with tholins believed to make up its dunes. The term "tholins," coined by Carl Sagan in 1979, describe the complex organic molecules at the heart of prebiotic chemistry. Cassini has mapped about 20 percent of Titan's surface with radar. Several hundred lakes and seas have been observed, with each of several dozen estimated to contain more hydrocarbon liquid than Earth's oil and gas reserves. Dark dunes that run along the equator contain a volume of organics several hundred times larger than Earth's coal reserves. "This global estimate is based mostly on views of the lakes in the northern polar regions. We have assumed the south might be similar, but we really don't yet know how much liquid is there," said Lorenz. Cassini's radar has observed the south polar region only once, and only two small lakes were visible. Future observations of that area are planned during Cassini's proposed extended mission. "We also know that some lakes are more than 10 meters or so deep because they appear literally pitch-black to the radar. If they were shallow we'd see the bottom, and we don't," said Lorenz. The question of how much liquid is on the surface is an important one because methane is a strong greenhouse gas on Titan as well as on Earth, but there is much more of it on Titan. If all the observed liquid on Titan is methane, it would only last a few million years, because as methane escapes into Titan's atmosphere, it breaks down and escapes into space. If the methane were to run out, Titan could become much colder. Scientists believe that methane might be supplied to the atmosphere by venting from the interior in cryovolcanic eruptions. If so, the amount of methane, and the temperature on Titan, may have fluctuated dramatically in the past. The image at the top of the page from the Cassini spacecraft looks toward Titan's south polar region, showing a depression within the moon's orange and blue haze layers near the south pole. Titan has water frozen as hard as granite and Great Lakes-sized bodies of fed by a complete liquid cycle, much like the hydrological cycle on Earth, but made up of methane and ethane rather than water. Methane and ethane, the simplest hydrocarbon molecules, can assemble themselves into fantastically complex structures. Since complex hydrocarbons form the basis of life on Earth, scientists are wondering if hydrocarbon chemistry on Titan could have crossed the chasm from inanimate matter to some form of life? Titan has been considered a “unique world in the solar system” since 1908 when, the Spanish astronomer, José Comas y Solá, discovered that it had an atmosphere, something non-existent on other moons. It seems perfectly appropriate that one of the prime candidates for life in our solar system. Titan can be viewed as an early-model Earth. And 100% of all known Earths have awesome life on them. The significantly lower temperature is a bit of a stumbling block (it's ten times as far from the sun as us), but there's a strong possibility of subterranean microbial life — or even a prebiotic "Life could happen!" environment. If a space traveler ever visits Titan, they will find a world where temperatures plunge to minus 274 degrees Fahrenheit, methane rains from the sky and dunes of ice or tar cover the planet's most arid regions — a cold mirror image of Earth's tropical climate, according to scientists at the University of Chicago. Titan's ice is stronger than most bedrock found on earth, yet it is more brittle, causing it to erode more easily, according to research by San Francisco State University Assistant Professor Leonard Sklar. Sklar and his team developed new measurements from tests on ice as cold as minus 170 degrees Celcius which demonstrate that ice gets stronger as temperature decreases. Understanding ice and its resistance to erosion is critical to answering how Titan's earth-like landscape formed. Titan has lakes, rivers and dunes, but its bedrock is made of ice as cold as minus 180 degrees Celcius, eroded by rivers of liquid methane. Titan is the only moon in the solar system large enough to support an atmosphere. Pierrehumbert and colleague Jonathan Mitchell, compared observations of Titan collected by the Cassini probe and the Hubble Space Telescope with their own computer simulations of the moon's atmosphere. "One of the things that attracts me about Titan is that it has a lot of the same circulation features as Earth, but done with completely different substances that work at different temperatures," Pierrehumbert said. On Earth, for example, water forms liquid and is relatively active as a vapor in the atmosphere. But on Titan, water is a rock. "It's not more volatile on Titan than sand is on Earth." Methane-natural gas-assumes an Earth-like role of water on Titan. It exists in enough abundance to condense into rain and form puddles on the surface within the range of temperatures that occur on Titan. "The ironic thing on Titan is that although it's much colder than Earth, it actually acts like a super-hot Earth rather than a snowball Earth, because at Titan temperatures, methane is more volatile than water vapor is at Earth temperatures," Pierrehumbert observed. Titan's dense, nitrogen-methane atmosphere responds much more slowly than Earth's atmosphere, as it receives about 100 times less sunlight than Earth. Seasons on Titan last more than seven Earth years. Its clouds form and move much like those on Earth, but in a much slower, more lingering fashion. 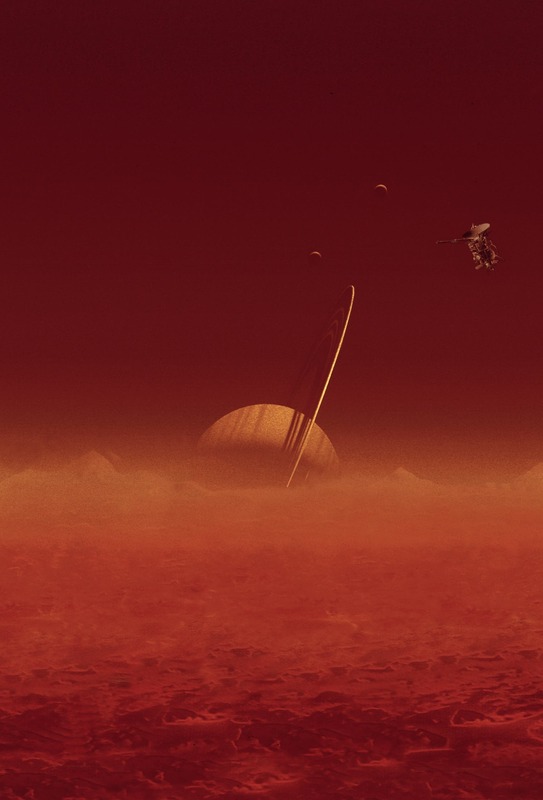 Physicists from the University of Granada and University of Valencia, analyzing data sent by the Cassini-Huygens probe from Titan, have “unequivocally” proved that there is natural electrical activity on Titan. The world scientist community believes that the probability of organic molecules, precursors of life, being formed is higher on planets or moons which have an atmosphere with electrical storms.Scientists with the Cassini mission have observed more than 200 clouds. They found that the way these clouds are distributed around Titan matches scientists' global circulation models. The only exception is timing — clouds are still noticeable in the southern hemisphere while fall is approaching. "Titan's clouds don't move with the seasons exactly as we expected," said Sebastien Rodriguez of the University of Paris Diderot, in collaboration with Cassini visual and infrared mapping spectrometer team members at the University of Nantes, France. "We see lots of clouds during the summer in the southern hemisphere, and this summer weather seems to last into the early fall. It looks like Indian summer on Earth, even if the mechanisms are radically different on Titan from those on Earth. Titan may then experience a warmer and wetter early autumn than forecasted by the models." On Earth, abnormally warm, dry weather periods in late autumn occur when low-pressure systems are blocked in the winter hemisphere. By contrast, scientists think the sluggishness of temperature changes at the surface and low atmosphere on Titan may be responsible for its unexpected warm and wet, hence cloudy, late summer. Cassini results so far don't show if Titan has an ocean beneath the surface, but scientists say this hypothesis is very plausible and they intend to keep investigating. Detecting tides induced by Saturn, a goal of the radio science team, would provide the clearest evidence for such a hidden water layer. "Additional flybys may tell us whether the crust is thick or thin today," says Jonathan Lunine, a Cassini interdisciplinary investigator with the University of Rome and the University of Arizona. "With that information we may have a better understanding of how methane, the ephemeral working fluid of Titan's rivers, lakes and clouds, has been resupplied over geologic time. Like the history of water on Earth, this is fundamental to a deep picture of the nature of Titan through time." The Epic 10-Year Probe of Titan –A Mirror of Earth's Early Atmosphere?